Last Thursday was a series of shockers for me. One is bearable but 3 in succession feels like it's too much for me to digest all at once. First, I received a text message that my girlfriend's condition in the hospital went from not good to worse. And later that night when I read more about the medical terms on Wikipedia, the more it scared me. Second, I was at Eastwood early evening and couldn't find my celphone. I had a hunch I left it in the car, which is actually better than losing it. I figured I just forgot to bring it. I just remembered my friend Ernie who I was supposed to pick up that night, that he just lost his celphone the other night in a taxi. I was hoping I wouldn't be receiving the same fate. So I went back to the car. I sorta panicked when after 5 minutes of looking under each car seat, I still couldn't find it. I took the flashlight then, opened all doors and crawled into the seat floors of the car. While I was losing hope, added pressure to me were 3 cars waiting for me to leave so they could take my parking spot. Don't they know I can't find my celphone and they're only interested in my parking space ? Well, can't blame them. They don't know why I was frantically moving from door to door. The security guard even had suspicions if that was my car because the way I looked puzzled. Get off my case guard. I'll show you my parking ticket if I have to. After 10 minutes of looking and a breaking out into a cold sweat, I finally found it. It wasn't actually on the car floor. It was behind the seatbelt buckle which was why I couldn't find it right away. After that, I drove to pick up Ernie. My knees were still trembling from that last incident. Because of the celphone incident, I was also late. I was supposed to pick up Ernie and go back to Eastwood. Since there were lots of people there that night, parking was terrible. I couldn't find a parking space nearby. Then, some guard directed us to park at a new parking lot, which I followed. To our surprise, it was a road that lead to an basement parking of an unfinished (and currently being built) building. It was scary that you parked in a place where you could see cement trucks and workers fully equipped to handle any falling debris while you and your car are totally unprepared for any such mishap. Plus the entire place smelling like fresh cement added to the creepiness of the parking lot. The rest of the night went well even though we were late. As the day was almost over, I was heading home feeling hungry, decided to pass by one of my favorite 7-11 branches to get a quick bite. When I parked, I noticed in front of the car was a man who was sitting down near the curve. Behind him was an ATM Machine. When I left 7-11, he was laying on the ground looking lifeless and almost looking dead enough to qualify for the "Night Of The Living Dead" cast. That scared me. 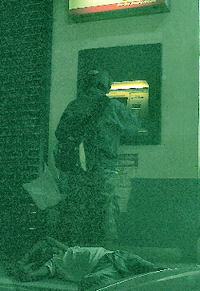 And there was this guy with a motorbike helmet using the ATM behind him who paid no attention to the man. It felt like it was a scene from a scary movie. Eerie. This is why I don't like watching scary movies. If it were anything close to my day, I'd be in shock the whole time. And just antipicating the shock leaves me agitated. Good night. Thanks Jhamie ! She was discharged from the hospital last night and is in need of a good rest. It's hard to function and keep focused when you know someone you care for isn't feeling well. On the lighter side, bilis mo magpost ha ! I just posted this less than an hour ago ! Doing your daily blog rounds ba ? heheheh ! cya ! hey...you're having a rought time pala. sorry, i'm not there enough. my prayers are always with you though.